2018 is going to come down to a photo finish. We already knew that November comics orders would come in behind those of November 2017, due to that month having an extra New Comics Day, bringing the year-to-date figure back into the red and making December the deciding factor. The question was how much December would need to make up. 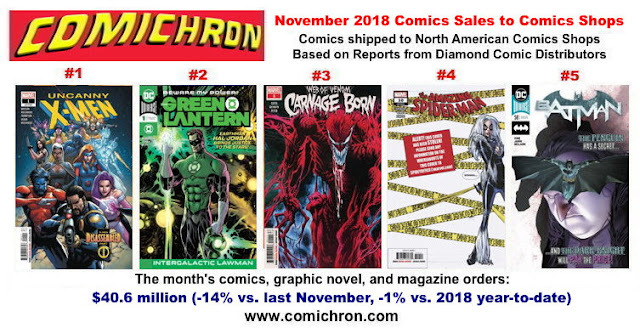 According to preliminary figures released today by Diamond Comic Distributors, the November loss came in on higher end of our estimated range for two major reasons: even with the shortened calendar, comics publishers did not commit nearly as many titles to the month — and increasingly, much of the holiday graphic novel business has moved to October. Click to visit our page for November 2018 comics sales estimates; the figures will be posted there on Monday. Fully 121 fewer new comics were released versus the same month in 2017, a drop of 22%; that's the smallest new comics slate since April 2016, before the DC Rebirth event began. Marvel's 79 new comic books was its lowest number of new releases since October 2015 — and DC's 67 new comics were down from 95 the previous year. Through the end of November, publishers have released 5,155 comic books in 2018, versus 5,472 in 2017. The year is not going to catch up; it's like 2017 had a few extra weeks of comics. 2018 has seen 6% fewer new periodical releases. That figure exactly matches the comics unit sales drop for the year — and is, in fact, evidence that comics periodicals are doing better, per release, than they were in 2017. Comics dollar sales this year are up close to 1.5% on those 6% fewer releases — and we know 2017's units were padded by many overships and 25¢ issues, so the true unit performance is probably a couple of points better than that 6%. So the "sales per issue" performance is better. Graphic novel slates were 12% smaller this November than in the previous November, but the 840-title October-November slate this year was actually 5% larger than 2017's total number of offerings. With Halloween being a New Comics Day, a big chunk of releases in advance of the holidays landed in October, instead. Dollar and unit sales changes for graphic novels are in a narrow range, so it doesn't appear that deep-discounting played a larger-than-usual role in the month. Despite the month's drop overall and its smaller slate, Marvel actually had a better month than it did the year before; its overall dollar sales were up 3%. 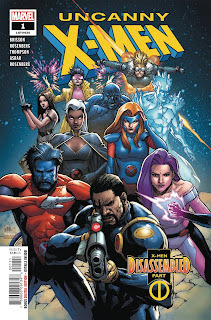 The publisher had the top comic book in dollar and unit sales in Uncanny X-Men #1, priced at $7.99. 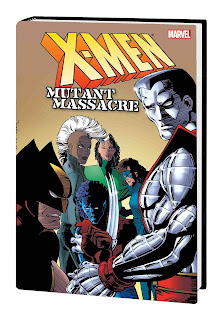 The top dollar graphic novel was X-Men: Mutant Massacre, priced at $100. It was also a big month for Venom. 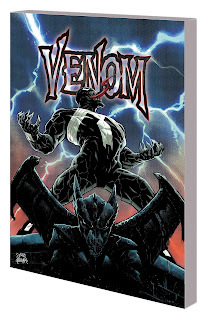 In addition to the surprising strong performance of the character's film in theaters, Marvel had the top graphic novel in Venom by Donny Cates Vol. 1 and a top-three new-comics finisher in Web of Venom: Carnage Born #1. DC benefited from a new Green Lantern #1, placing second. Overall, it was a much softer month for DC comparatively, year-over-year, largely because of the aforemetioned smaller slate; DC also had timing issues in play, as November had no new releases from Doomsday Clock or the bimonthly Batman Damned. Both those get new issues in December. Image was off single-digits year-to-year after a big graphic novel month, and Dark Horse was up substantially. Be sure to subscribe on Youtube to get all the videos as they release. We see that in the dollar rankings, Web of Venom: Carnage Born #1 passed Green Lantern #1, which was ahead of it on the unit charts. How could that be, when they both cost the same? Simple: the dollar charts are based on invoiced dollars, or what retailers paid Diamond. The mix of retailers ordering Green Lantern must have gotten a slightly better discount from DC than the mix ordering Venom got from Marvel comics. Every retailer's discount is calculated individually based on their order volumes. Which brings us back to December's role in how 2018 finishes. As the autumn has progressed, I've been tending to think that the market would finish slightly ahead for one reason: that December 2017 was such a low target to beat. Its orders of $38.49 million made it the weakest month of 2017, worse than any winter month earlier in the year. The size of November's slate reduction, however, has increased the difficulty. The second half of 2018 will finish ahead of the second half of 2017. 2018 will finish at $519.57 million, down 0.5%. The 4th Quarter of 2018 will finish positive, resulting in three up quarters in a row. 2018 will finish above $522.24 million, ahead of 2017. So looking at the above, a second-half beat is very likely; that's because the weak part of 2018 was last winter. As to whether the other targets can be beaten, what is likely to matter most is how much material publishers bring to market. Advance reorders for December 2018 showed good results for Batman Who Laughs #1 and Batman Damned #2, as well as the Aquaman Omnibus, timed for the new movie. So stay tuned — and drop back Monday when we'll have the individual title sales estimates for November. 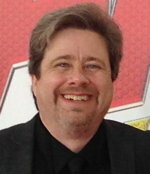 Comichron founder John Jackson Miller has tracked the comics industry for more than 20 years, including a decade editing the industry's retail trade magazine; he is the author of several guides to comics, as well as more than a hundred comic books for various franchises, including Star Wars, Star Trek, Halo, Mass Effect, and Battlestar Galactica. He is also the author of novels including Star Wars: Kenobi, Star Wars: A New Dawn, and the Star Trek: Prey trilogy. Read more about them at his fiction site.Be sure to follow Comichron on Twitter and Facebook, and check out our Youtube channel.